Hello ! My name is Kevin and i am 16. I was very interested in that esc project of yours. Unfortunately i couldnt find all the parts for the build therefore had to modify it. I had the IRF3205s but not the drivers as the ones i could find were freaking expensive. 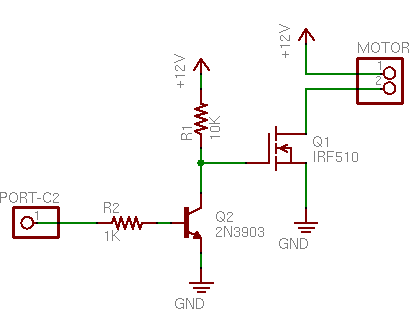 So i made the circuit using the two lm339 comparators to drive the mosfets. As the comparators were open collector types , i had to modify the code too but setting LOW to HIGH and vice versa . i drove the mosfets by attaching a 10k resistor to its gate to 12v+ and attaching the output of the comparator to the gate , so when the input changes the voltage on the gate can be brought down or up thus enabling the mosfet. On breadboard it worked quite a bit , the brushless motor spun but with difficulty and vibration which i believe was due to the loose connections so i decided to move it to a veroboard for testing . i completed wiring it all up but when i try to use it the motor simply vibrates and tries to turn , but most of the time the arduino just turns off like if there is a short , i have doubled checked the circuit using a multimeter and also the connections going to the arduino . Everything was just the way it was on the breadboard and the way it is supposed to be . Please help me out here ... Thanks a lot for this project and the explainations. this here is the schematic i designed , please ignore the arduino part and the voltage regulator part as i have'nt completed that yet , i had to make this up in a hurry so there might be some obvious mistakes , sorry ! Also, first you should try the code with no EMF: If that works, then try the one with EMF. Keep up! Thank you so very much for the answer , it is a pull-up resistor , i tried using a bjt but it wasnt as effective as the comparator . the outputs AA1 , BB1 and CC1 from the arduino goes into the 1 , 2 , 3 inputs of one comparator and outputs from this comparator(1,2,3) goes to the high voltage mosfets of A , B and C respectively. the outputs AA2, BB2 and CC2 from the arduino goes into the 1,2,3 inputs of the other comparator and the outputs of this comparator goes to the grounded mosfets of A , B and C .
All these mosfets are pulled high with a 10k resistor. Source of the high voltage mosfets are connected to the drain of the grounded ones. i put two 1k resistors in series to make 2k (one connected to the outputs from the mosfets of course) in total and 1k resistor to make the voltage divider for back emf. i hope all this right... Thanks a million! hello , sorry about this constant commenting but i tried with bjts and it looks more promising than comparators , but unfortunately with the bjts and the no emf code , the motor spins a few degrees and stops and keeps beeping with no vibration , when i touch the rotor , it feels hard like it is braked and also one of the mosfets get extremely hot! . Please help me , what am i doing wrong here?? Thanks once again !